Party.San OpenAir will take place in Schlotheim, Flugplatz, Germany on August 7-9, 2014. Napalm Death, Obituary and Ereb Altor are among the bands that will perform at the Party.San OpenAir 2014 festival. SWR Barroselas Metalfest XVI will take place in the small village of Barroselas, in the north of Portugal on April 24-27, 2013. Possessed, Belphegor and Agalloch are among the bands that will perform at the SWR Barroselas Metalfest XVI festival. Auditory Assault Festival is the second festival coming to you from the same guys who organize the annual Maryland Deathfest in Baltimore, MD. 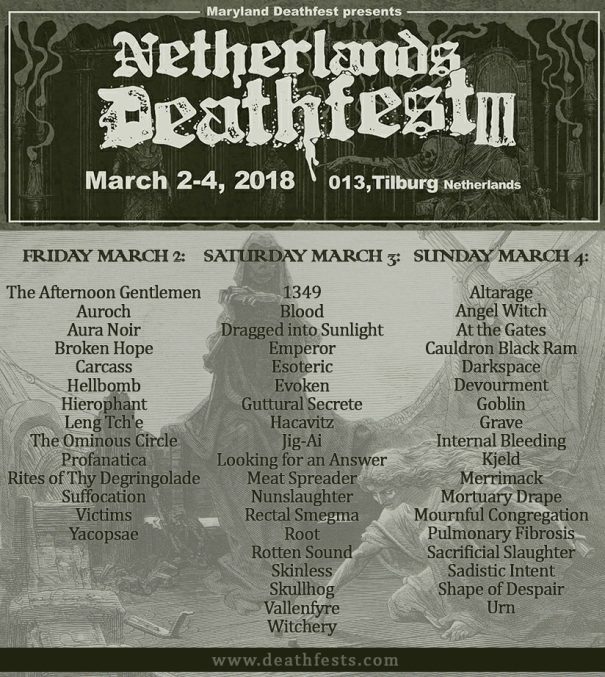 After 6 years, 160+ different bands representing 18 countries, and several venue changes, the Maryland Deathfest (or “MDF” for short) has developed into the premier underground metal festival in the United States, and one of the most talked about festivals internationally. Napalm Death, Disfear and Blood Duster are among the bands that will perform at the Obscene Extreme festival, held in Svojsice u Pardubice, Czech Republic on Jul 16-18, 2009.